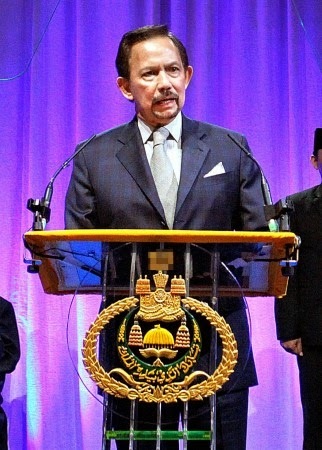 His Majesty was grateful that this year Brunei has achieved 100 Years of Formal Education. This showed that the nation, since the very beginning, had given serious attention to education. The past 100 years have required the nation to be aware of change, as change never waits to see the country advance or otherwise, the monarch said. His Majesty highlighted that the world is constantly changing and this change requires the people of Brunei Darussalam to continuously prepare themselves. His Majesty went on to say that this was the reality of change, which demanded the people to be more creative, dynamic and skilled, especially changes in education that started from the beginning and continued to primary and secondary school, technical education and tertiary education. His Majesty stated that according to expert analysis, there were three important factors required in order to achieve the best education system, which were getting the right people to be teachers; developing teachers to be effective educators; and ensuring every child’s success through quality education. His Majesty added that upgrading the quality of education holistically meant strengthening the education system at the primary level. This included improving the level of expertise at the national level which was benchmarked against international standard. His Majesty emphasised that an enhanced education at the early level is key to educational success at the subsequent level. On achieving international standard, His Majesty was pleased that Universiti Brunei Darussalam (UBD) had transformed itself into a world ranking university, which has excelled in teaching and research. This year, UBD is ranked at the top 50 in five out of nine indicators in Asia in the QS Ranking. His Majesty further added that Universiti Brunei Darussalam in the year 2012 had introduced the prestigious ‘The Chancellor’s Scholar’, which was in its third year of conferment this year. His Majesty congratulated the two scholars who were conferred ‘The Chancellor’s Scholar’ for the 2014/2015 session to do a doctorate degree (PhD) in a well-known institute. His Majesty hoped the recipients will continuously improve themselves to achieve success and advised all students, whether on government scholarship or privately funded, to work and study hard to achieve their goals. His Majesty reminded them that they must never let themselves be exposed to detrimental influences not associated with knowledge and education. His Majesty added that students must be vigilant against destructive elements lurking everywhere and continuously entrench themselves with good virtues and deeds, which Insya Allah, will protect them. His Majesty further reminded the students to uphold their identity, integrity and Bruneian spirit, and to always practise MIB’s way of living and thinking, and not otherwise. The ruler also reminded the students that the pride of a nation is not measured from efforts to become a new nation, but when it successfully maintains its heritage and identity. At the end of the titah, His Majesty sincerely prayed that the students will always be in the protection of Allah the Almighty and be successful in their studies. Earlier, Their Majesties were greeted on arrival by Major General (Rtd) Dato Paduka Seri Haji Aminuddin Ihsan bin Pehin Orang Kaya Saiful Mulok Dato Seri Paduka Haji Abidin, High Commissioner of Brunei Darussalam to the United Kingdom and Northern Ireland and wife, Datin Nurhanaya Janis binti Abdullah Lim; as well as Radin Abdullah bin Radin Mas Basiuni and Khairiyyah Al-Hasnaa binti Hasan, President and Acting Vice-President of the Association of Students of Brunei Darussalam in the United Kingdom and Northern Ireland (Brunei Students’ Union). Accompanying Their Majesty at the ceremony were His Royal Highness Prince ‘Abdul Malik; His Royal Highness Prince ‘Abdul Mateen; His Royal Highness Prince ‘Abdul Wakeel; Her Royal Highness Princess Hajah Majeedah Nuurul Bolkiah; Her Royal Highness Princess Fadzilah Lubabul Bolkiah; and Her Royal Highness Princess Ameerah Wardatul Bolkiah. Their Majesties proceeded to the Wellington Ballroom for afternoon tea with senior government officials as well as students who achieved excellence in their studies and active in extra-curricular activities. Later, His Majesty and Her Majesty signed a commemorative parchment, followed by a group photograph session with senior officials from the High Commission of Brunei Darussalam in London as well as the President and Acting Vice-President of Brunei Students’ Union in the United Kingdom and Northern Ireland. Their Majesties also consented to have a photograph session with the recipients of Universiti Brunei Darussalam’s ‘The Chancellor’s Scholar’ for the 2014/2015 session. His Majesty and Her Majesty then proceeded to the Grand Ballroom for the Get-Together Ceremony. The ceremony began with Brunei Darussalam’s national anthem which was followed by the recitation of verses from the Quran by Mohammad Faiq bin Haji Rani. The translation of the verses was read by Ahmad Aiman bin Haji Laidin. The ceremony was followed by a Doa Selamat by Pehin Datu Seri Maharaja Dato Paduka Seri Setia (Dr) Ustaz Haji Awang Abdul Aziz bin Juned, the State Mufti. The ceremony proceeded with a welcoming remark by Radin Abdullah bin Radin Mas Basiuni, the President of the Brunei Students’ Union in the United Kingdom and Northern Ireland. After His Majesty delivered the titah, the monarch consented to confer ‘The Chancellor’s Scholar’ to two students namely Siti Nurul Azian binti Zakaria who is currently pursuing a doctorate degree (PhD) in Chemistry at the University College London and Nur Liyana binti Haji Ahmad who has been offered a place to do a doctorate degree (PhD) in Clinical Medicine at the Imperial College London. At the ceremony, Their Majesties also consented to receive a pesambah from the President and Acting Vice-President of the Brunei Students’ Union in the United Kingdom and Northern Ireland respectively. 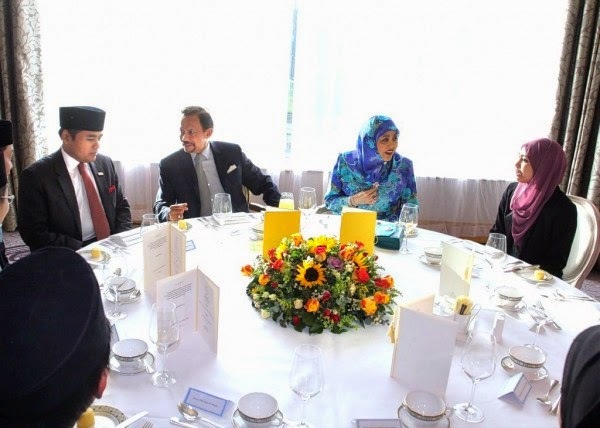 His Majesty and Her Majesty later consented to meet around 2,400 citizens and residents of Brunei Darussalam in the United Kingdom and Northern Ireland comprising students, government officials who are currently attending courses as well as those who are on holiday with their families.